Project Manager Emily Vandivert posing for a picture with Chancellor Schrader. Why did you join the Solar House Team? I joined Solar House because I am very interested in sustainable building design. I also think the fact we actually build a house that we design is super awesome. What is your favorite part about being on the team? The people I am able to work and interact with on a daily basis are incredible. I learn so much everyday from my peers and professionals outside the classroom. I am the Project Manager for the team. I make sure everyone stays on task and we meet our deadlines. Effective communication is key as I work with university faculty and outside sponsors. What “Solar House” advice would you give to the general public? Solar panels are great, but not the only option to increase the efficiency of your home. Building insulation and orientation and window type play key roles in the overall building envelope and can be implemented in the design phase without much added cost. Random fact about yourself. Ready. Go! I can eat a copious of watermelon. The Steel has arrived and is currently in the process of being put together. Starting on Saturday, team members gathered at the Student Design and Experiential Learning Center and began assembling the structure that will support the solarium. The first day was a little rough with many broken drill bits, but by the end of the day we were powering through section by section. On Sunday, the team hit a slight set back. Mother Nature decided to make it rain. Sad day :(. Fortunately the sun poked its rays through the clouds and allowed us to continue constructing the Chameleon House!!! …even if the rain did come back for a little to get us all wet… but that’s okay! We adapted to our environment and continued to make progress! Here’s a picture of some of the team members on what will be our solarium! Check back for more updates on the Chameleon House! of the WNBA and the Kings of the NHL. Can you spot the solar panels? 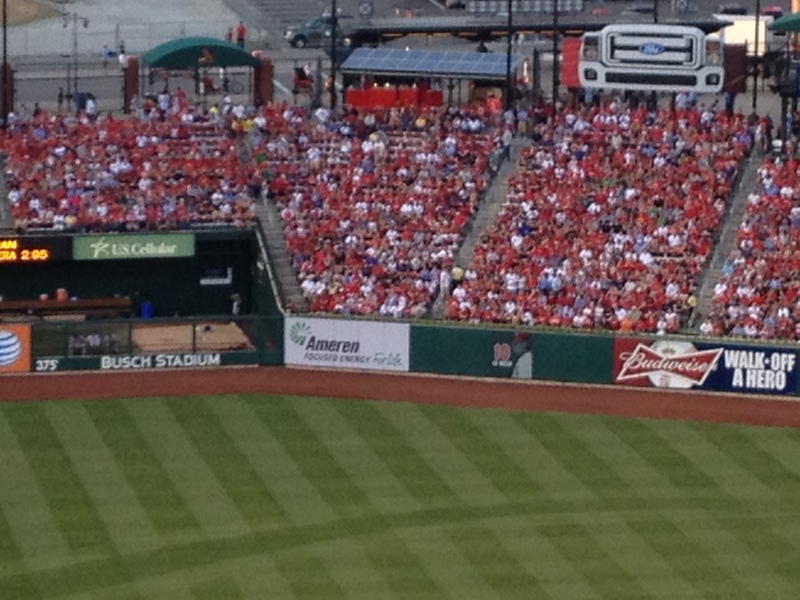 Here is a picture that I took during a Saint Louis Cardinal Baseball game this past summer. If you look closely you can see them in the background of the crowd above the concession stand. Bush Stadium has partnered up with a few companies including Microgrid Energy, the Electrical Connection and Sachs Electric to ensure baseball fans get their hotdogs grilled up by solar power. Energy costs have in fact been cut by up to 20 percent since the new ballpark opened in 2006. The ballpark has a huge commitment to do as much as they can to go green including cutting water usage by 10 percent. By further adding these solar arrays they are sure to cut even more energy. Their are 106 panels that are set atop the roof of the ticket building and the canopy out in left centerfield. The actual panels are manufactured by Schott Solar and are not connected to any batteries because they are fed to the grid directly. Thus the panels are only supplying power to the stadium. 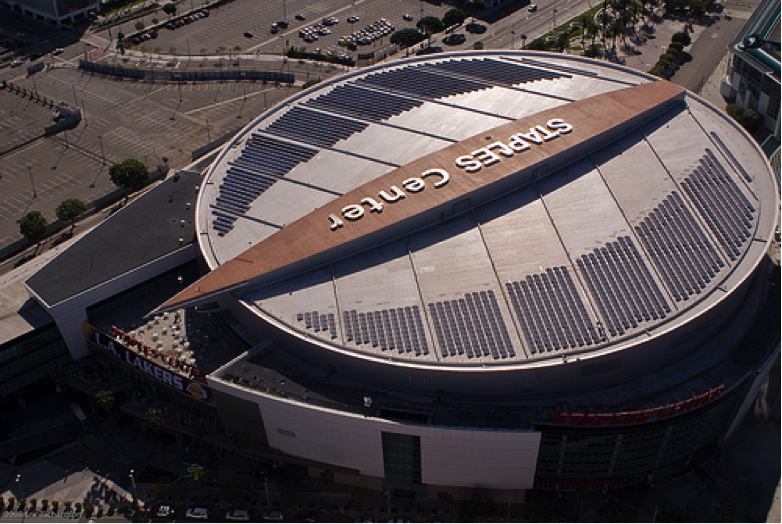 Each year the panels will provide about 32,000kWh of pure clean energy. Here is a link to watch a little video about them. GO CARDS! The team had a great time meeting with one of our professional advisors, Tom Wilson. A few members were able to give him a tour of the Solar VIllage so he could see all of our previous houses. We then had a very productive meeting with him in the SDELC. He had a chance to look over our plans for the Chameleon House and suggest things to help improve the design based on his experience in working on many other projects. It was great to be able to meet him and his advice along with the rest of our advisory panels will help this be our best house yet. After Tom left all of the team leads were able to meet and work on the budget and our scheduled for building the house. It was a very productive meeting for all of the leads and we all got a lot of work done. Overall it was a very productive day for the team. Thanks for making the Groundbreaking an Awesome Event! Thanks to everyone who came out to the groundbreaking on friday and making it a great event. We had a lot of amazing people come and all of the members of the team enjoyed getting the opportunity to talk about what we are up to with the 2013 Solar House. We also got to give tours of all of our previous houses to people in the community who are interested in what we are doing. The most exciting part of the day was defiantly the groundbreaking at the end. We got to hear speeches from Dr. Hirtz who was representing the SDELC at the event, the chancellor of the Missouri S&T Dr. Schrader, Mr Pickerill who is the teams main advisor, and our project manager Emily Vandivert. 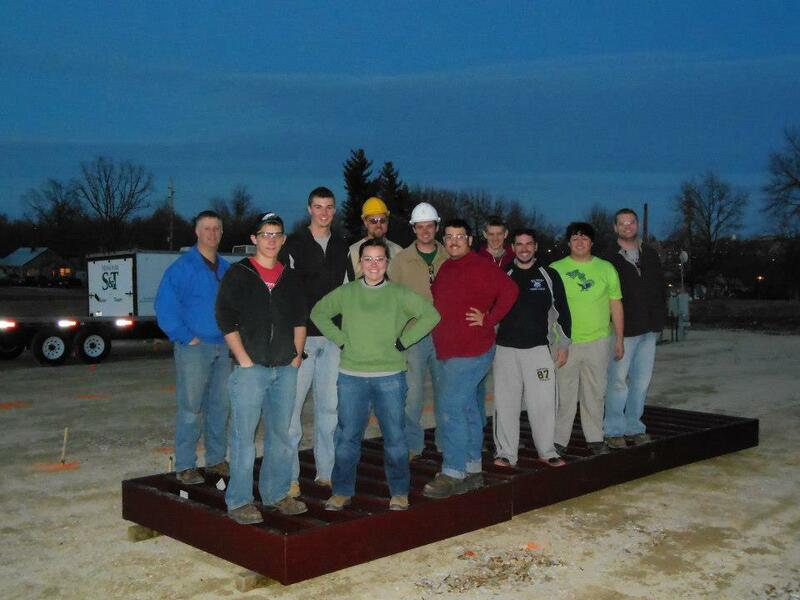 Overall it was a great event, and a great start to the building of our 2013 Solar House! If you want to see more pictures you can see all the pictures from the event on our teams Facebook page in our Groundbreaking Album. Also while you are there you can check out the rest of our pictures and like our page to keep up to date on all of our activities. 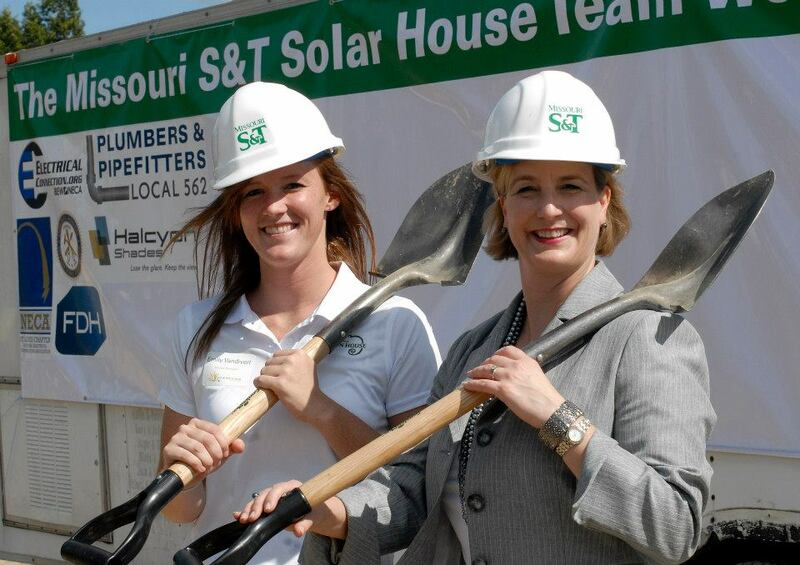 This Friday, August 10th the team is hosting a groundbreaking ceremony and a “solar social”. The groundbreaking ceremony will be held at our build site on 10th Street in Rolla – on a portion of the property used for Missouri S&T’s golf course. There will also be solar village tours given from 2:30-3:30 p.m. before the groundbreaking ceremony. 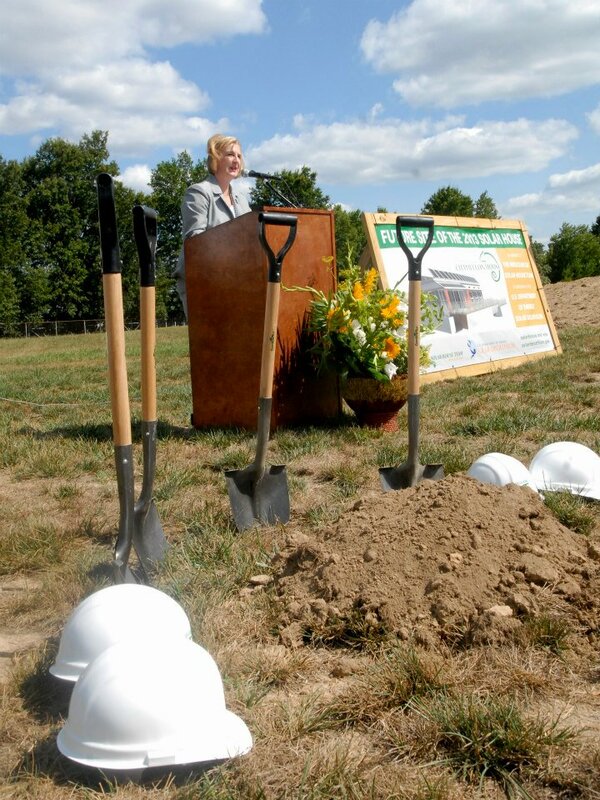 We are very excited to break ground on the project so we can begin on our work towards the 2013 Solar Decathlon. 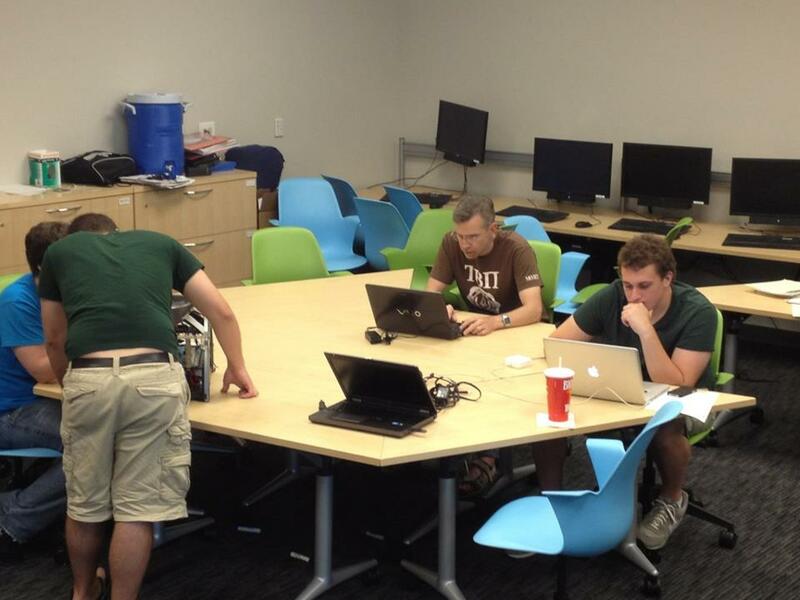 The team is currently finishing its new designs and will soon begin building the 2013 solar house. We hope to see you all there! Solar house team hard at work over the summer! This summer the Solar House team was fortunate to be able to have six team members sponsored to stay in Rolla during the summer. These students were able to work on solar house without the distraction of classes and other things during the school year. So far these students have been able to work on drawings, specifications, public relations things, and travel to visit some of our sponsors. So far they have been able to do a lot of work that we would not have been able to do without them. This has allowed the team to stay on schedule and make sure everything gets taken care of. When we were accepted into the Solar Decathlon we were pretty excited and we wanted to make sure everyone on campus knew that we got in. This last weekend four of our team members were able to attend the Kansas city Remolding Show. 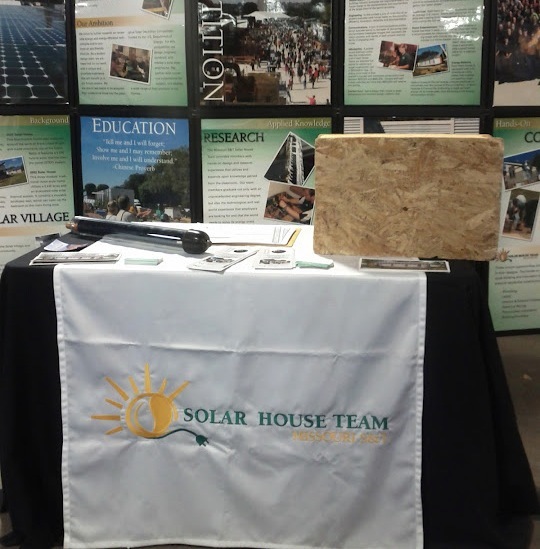 We had the opportunity to talk to many people who attend the show and talk to them about our team and about our next solar house. We were also able to visit the booths of other companies that were in attendance and talk to them about our team and ask them questions that we had about their products and ask them for advice in some of our designs. Overall it was a great weekend and a good way to promote our team.